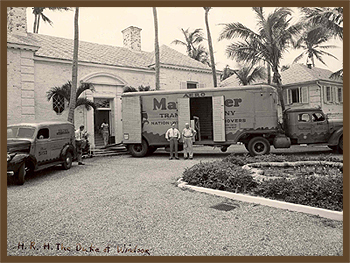 In 1925, Richard R. Brown, Sr. founded Brown Moving & Storage in West Palm Beach. 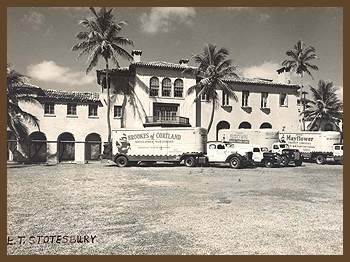 Starting with one truck, the company grew over the years while operating out of many offices and warehouses. in West Palm Beach. In 1933, he joined Mayflower Van Lines and in 1955, served as president of the Mayflower Warehouseman Association. 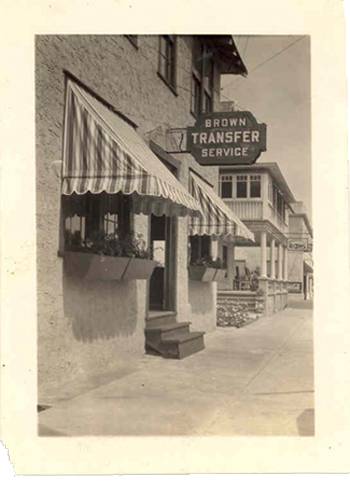 That relationship lasted over 70 years, but today, to better serve our customers, we operate independently as Brown Moving & Storage. Richard R. Brown, Jr. began working for the company on a full-time basis in 1944. In 1968, he designed and oversaw construction of our current office and warehouse at 1900 Old Okeechobee Road. Both Mr. Brown Sr. & Jr. experienced the catastrophic 1928 hurricane. This building was designed with hurricanes in mind. With updating and continuous improvements, this facility is one of the finest furniture storage warehouses in the country. It is fully air conditioned and has a backup generator system. Mr. Brown worked with many professional & charitable organizations, serving as Chairman of the Chamber of Commerce of the Palm Beaches in 1975. Today, the business is in its third generation of family management. In 1976, following his graduation from the University of Florida College of Business Administration, Ian Brown joined the company. He is the current president and general manager. The company has now been under his leadership for the last 31 years. He is a past president of the Florida Movers & Warehouseman's Association and served as their treasurer for 20 years. Under his direction, in 1991, Brown Moving & Storage, Inc. was awarded the Better Business Bureau's Golden Bee Award. Lisa Brown, a 4th Generation family member and recent Masters graduate from Florida Atlantic University, has come on as the Director of Marketing and Web Development.